William, Kate and Harry travelled to the Olympic Park in a state car after the Buckingham Palace reception, where the trio joined other members of the Royal family for the Olympic opening ceremony. 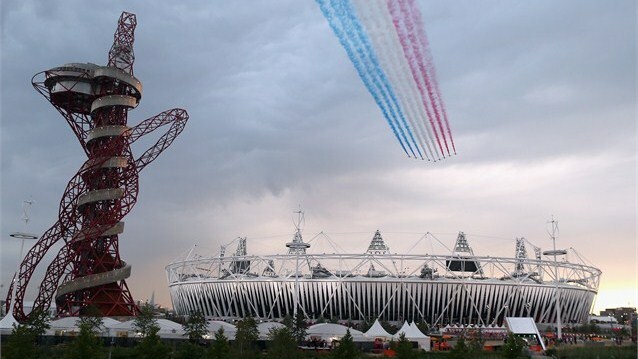 The Red Arrows flypast the stadium before the ceremony. William, Kate and Harry watch the flypast. William and Kate exchanging thoughts on the ceremony. 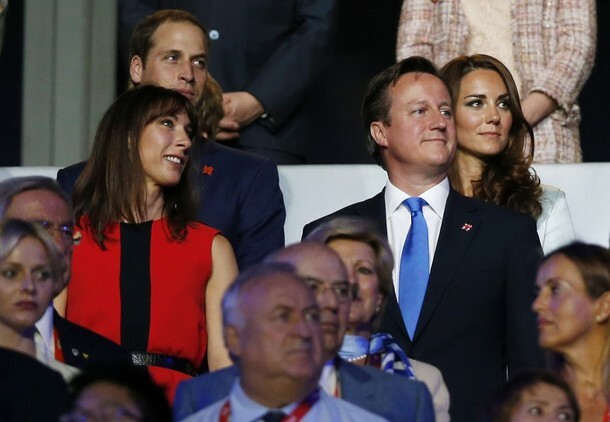 The young royals were seated behind Prime Minister David Cameron and his wife Samantha. 80,000 spectators filled the stadium. A stunning view! The much anticipated ceremony was themed around the notion of the 'Isles of Wonder'. The concept was inspired by Shakespeare's 'The Tempest'. Film director Danny Boyle (best known for directing Slumdog Millionaire) was at the helm of the £27 million production which is reportedly being watched worldwide by over one billion people. 'The ceremony is an attempt to capture a picture of ourselves as a nation and will celebrant the exuberant creativity of the British'. 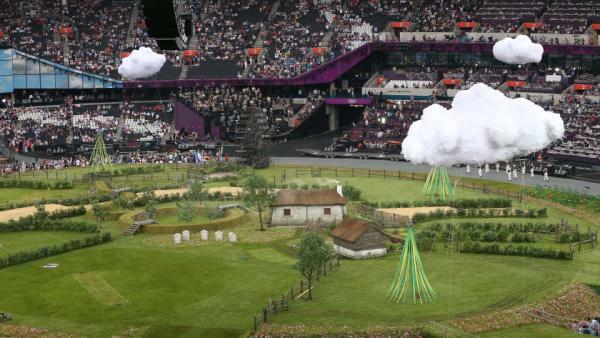 The Olympic stadium has been transformed into a countryside setting and has been described as 'The Olympics meets the Shire'. A cast of 15,000 volunteers took to the stage with a number of four legged friends. Animals played a central role in the beginning of the show which served as a 'Noah's Ark' of British livestock. 70 sheep, 12 horses, 10 chickens, 10 ducks, 9 geese took part. The UK of the 19th century transforming as it industrialises. Her Majesty's entrance could only be described as legendary. The show cut to a pre prepared film of Daniel Craig (as James Bond) escorting the Queen from Buckingham Palace to the stadium via helicopter. Two figures were then seen parachuting into the stadium and moments later the Queen and Prince Philip emerged, a wonderful touch and lovely to see HM's fun side :) The Palace said her Majesty was 'delighted to be involved in something so exceptional'. William, Kate and Harry in the audience. 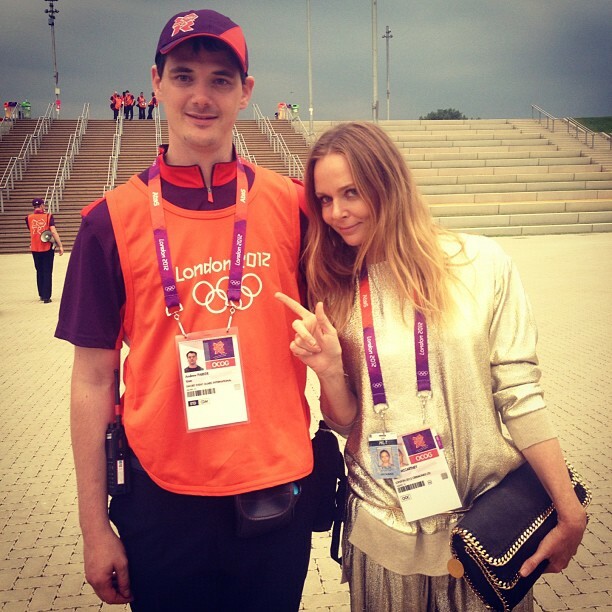 Team GB kit designer and Kate favourite Stella McCartney at the ceremony. 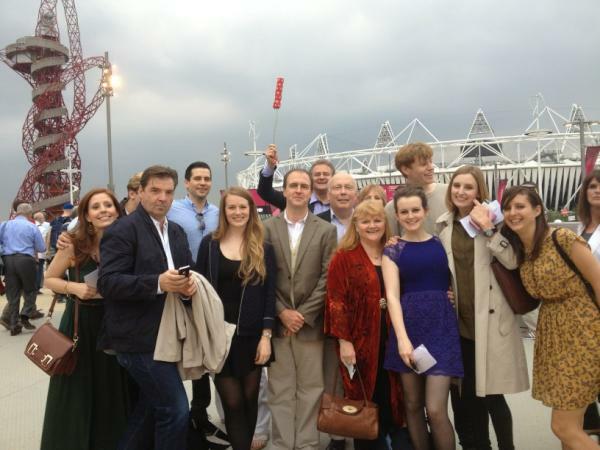 The Downton Abbey cast were in high spirits outside the stadium. 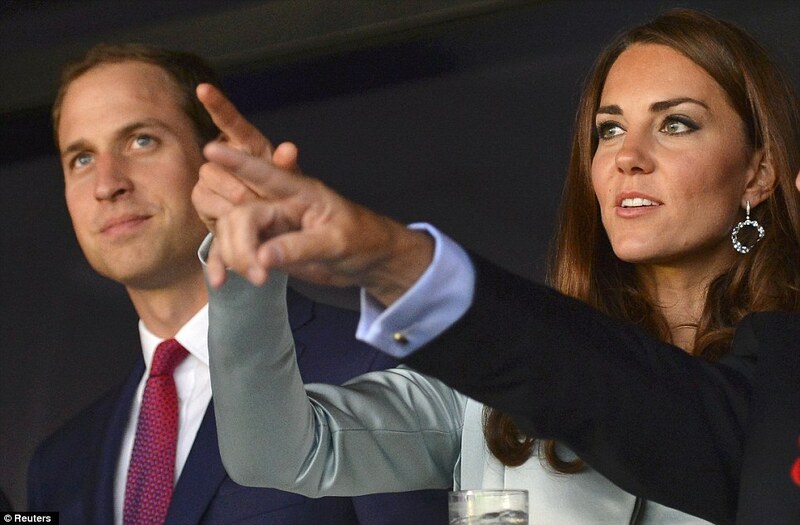 William and Kate are said to be huge fans of the show. The five Olympic rings , forged from red hot metal, light up the ceremony. Kate wore the same Christopher Kane bespoke coatdress she wore to the reception (a Palace aide suggested she would not have time to change). To read more on Kate's look please see today's earlier post. 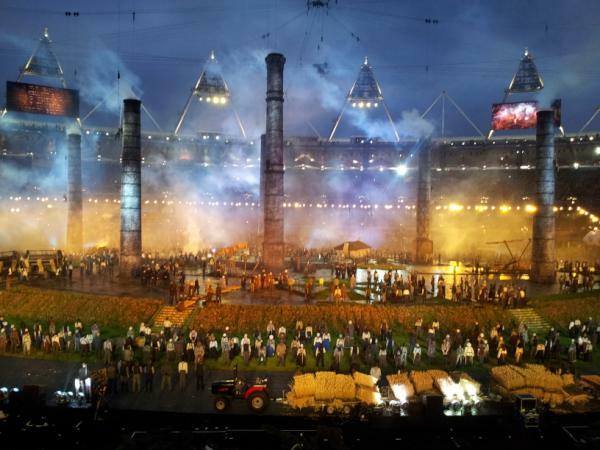 It was an incredible ceremony and Danny Boyle certainly showed the 'great' in Great Britain. I hope you enjoyed it too. 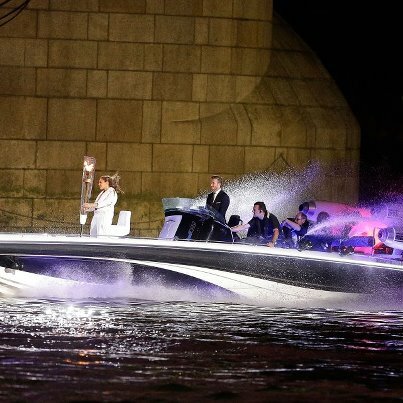 David Beckham piloted a speed boat and its torch bearer to the stadium. It was way too long. When they cut to Kate,she didnt look happy. Those are some big diamond earrings on Kate! Wonder if they were a gift from her Prince? Never seen her wear them before. Just been watching the ceremony in 3D! It looks absolutely amazing! Cannot imagine what it must be like to be there the atmosphere must be incredible! Proud to be british!! Kate looks like she's really enjoying it! I'm jealous :p I love her earrings! Very bling and glam! Charlotte you're the best!!! !Thanks for the link!!! What an awesome show!! 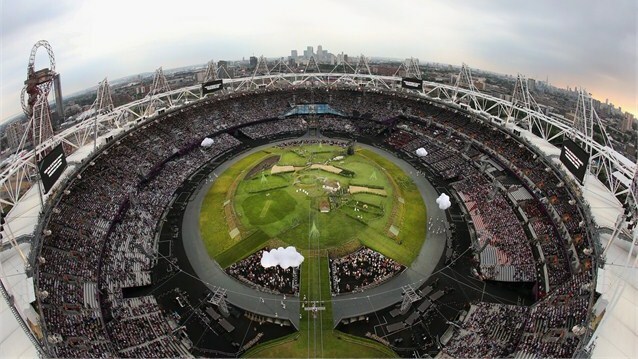 Great Britain is making an absolutely flawless Opening Ceremony! Watching it live here! I am feeling very patriotic right now! Duchess Catherine is looking fantastic! Charlotte, any news on the Duchess's earrings? They are beautiful just like the Duchess. Wondering if they were a gift from her Prince. Never seen them before. Great post today as always. Lovely outfit and it's nice to see her wearing larger earrings. Yes! :) I can't wait to watch the ceremony. The photos are spectacular!!! I hope those of you in the US who haven't seen it yet enjoy it. I thought it was wonderful. The earrings are lovely, as of yet we don't know the designer but I'll update when we do. Possibly Kiki's..
Duchess, I thought the opening ceremony was the best one I have ever seen. What an amazing representation of the culture and there was sooo much for the eyes to absorb! :) Just cannot say enough about it. I also wonder how William and Kate felt to see the image of their balcony kiss! What a surreal moment, I thought. Regarding the earrings, I would love to know the source if/when you can share the information. With Kate's long hair, I think larger earrings look better on her - better proportion-wise. And I also believe that was the reason she did not wear a brooch as some people suggested. It would have been OTT, IMO. really like the earrings - adding a glittery, fun, youthful touch to her ensemble. 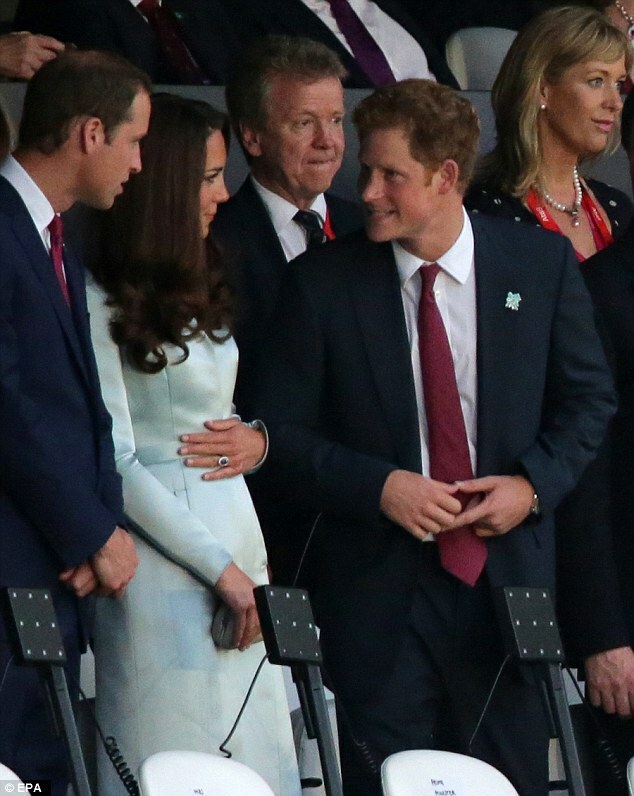 it looks like kate, will, harry are having a lot of fun! it must be surreal to watch a ginormous screen show your wedding kiss to 80,000 ppl! does anyone else think it's odd that charles and camilla are seated so far from the queen? 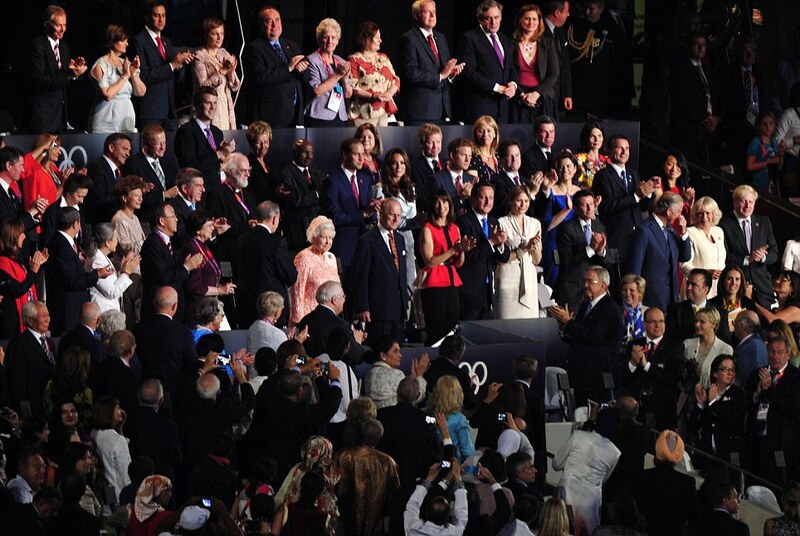 Congratulations to all of Great Britain on what is so far on US tv a spectacular opening ceremony! Best line of our broadcast: and the Queen is......a Bond Girl! for whoever posted a comment earlier today, about the shine probably not being so bad in person: you're right! it looks much better in natural light, than under flash bulbs. The body language between William and Kate during the Olympics was a bit painful to watch. He barely looked at her even when she was talking to him. Then, there was that pic of them in the car where she looked miserable. I hope this couple makes it. I love Kate and her style and quiet strength and hope he doesnt do what his father did to his mum. You can't expect them to look deliriously happy in every photo or shot, especially on such a long night as the opening ceremonies. Why are people trying to find thing wrong in the marriage of the beautiful Duchess and her Prince? @Anonymous- I don't know why you think it was painful to watch the Duchess & her Prince, they looked like they were having a great time. Just remember they had a really busy day and it was getting late. By Anonymous above and to all who frequent this blog, I follow the relationship of William and Kate from the beginning and I've noticed is that they began to behave exactly like the time they were dating. Who does not remember when they were leaving nightclubs and William went out with a face of one who was drunk and barely looked to Kate's face? And yet, he thought she would be the right girl for him to marry. What happens is that we are making a comparison with William and Kate from last year, where they were in the spotlight and their wedding was considered the event of the year. A year passed after the wedding, they returned to the same couple at the time of courtship, but as they are always under the media's focus, most people have observed their behavior. Another thing I noticed too, Kate is more serious at the events and I think this is due to protocol lessons on how the royalty should behave in different occasions. 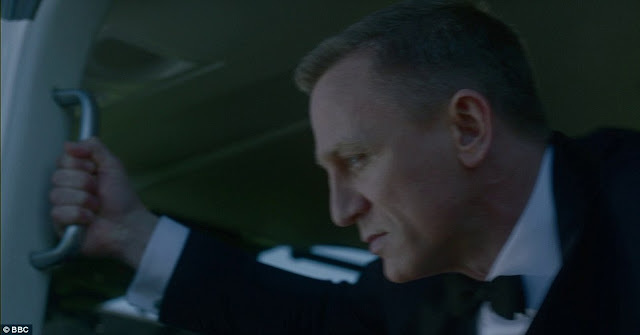 I have also observed the expression of them in the car and actually I had the impression that Kate is too serious, however, in general, she behaves very well and has taken the life of a royal decent and competent manner. Like you, Anonymous, I also hope that William did not make the same mistakes as their parents and he also said that he wanted to spend the rest of his life beside her, and I expect it to happen. We see the couple in some events during the Olympics, where they will be alone, only the couple, without other royals around, then we can look in detail how they are acting with one another. And just to finish, I read some stories that William was probably sorry he married Kate, but in my honest opinion, I think he has no right to regret about this, because he flirted with her for almost 10 years, he knew her very well, and had many opportunities to break up as soon as possible and meet new girls. Why not take this attitude? Why chose to marry Kate? I think it was for love, right? Meanwhile, we are here waiting for "the scenes of the next chapters" ... Kisses! Oh Ana Laura- I hope you don't take all this crap being written about this beaitiful couple to serious. Just sit back and think that William was not forced to marry Kate nor was is being pressured to get married by anyone. Next he said in his engagement interview that he has learnedfrom his parents mistakes and that his marriage to Kate will last. And I am sure that his grandmother had a good talk with him before he got married telling him that he better br sure that Kate was the one he loved becuase the royal family could not have another divorce. I am sure that William did not make a mistake when he married the beautiful Kate nor does he think so. And what does their past night club stuff have to do with their live now? William when out once and got drunk, that does not mean there is trouble with their marriage. As far as Kate being serois at events, I don't know what pictures you have been looking at but all I have seen is her beautiful smile. And when the two of them are together they are smiles and maybe a few serious looks but that does not mean there is problems. Go and look at photos from Getty Images, newscom and a few others. Take a look at tthem at Wilbeldon, Opening of the Olympics, polo match and I can go on but these photos tella whole different side of teh royal couple. They will show how happy they are. So let'd sit back and enjoy their journey together. Again this is just my opinion. No, Pauline, you got it wrong, sorry if I wrote in a way that gave the idea to other interpretations. Actually, I was responding to Anonymous, and I just wanted to say that I believe William married Kate for love and what he actually said in the interview of the engagement, did not want to repeat the same mistakes their parents and would like his marriage lasted for the rest of their lives. You're right in that sense. As for my position with respect to the time when they were dating, I'm not coming back to explain, because I do not think feasible, and it is best to seek healthy discussions. You can be sure, Pauline, I really respect your opinions. Kisses! I am sorry I missed understood what you wrote. I am just tired fof the media writing all this crap about the Duchess and her Prince. And I think you are too. I just don't understand why they can not leave this beautiful couple alone. I know they are royal but they do have a personal life too. When they are out doing their engagements fine write stories about them, take all the pictures they want but once they are finished don't write crap about their personal business. I just want you to know Ana Laura that I too respect your opinions and love reading what you have to say. so now let's sit back and enjoy this beautiful couple. Charlotte, would be interesting if you sent your honest opinion about these rumors that the couple is not real good (the relationship), because I have a friend who lives in England and she said that this rumor is not consistent here. And, as you always so polite and kind to us, I think your opinion is very important. Kisses and excuse me for being, sometimes, rude in my opinions, but it's because I really like the couple and did not want them ended the same way as many other real couples ended. Ana Laura - To be completely honest the rumours are, in my opinion, completely ridiculous. There is no sense in the UK nor among the press that there is any problem with William and Kate. In fact, it's quite the opposite. Many remarked on the fun they had at Beacon's College and Wimbledon lately. 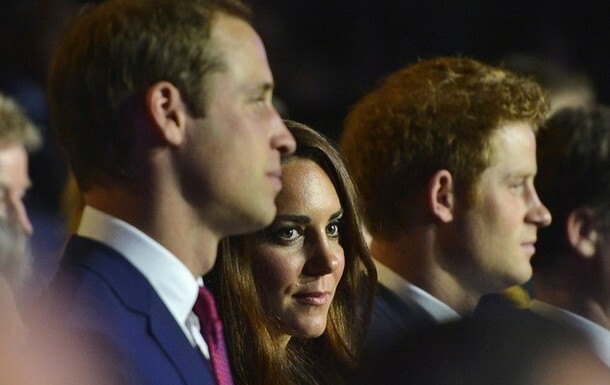 A royal correspondent said William, Kate and Harry appeared to be having great fun at last nights Olympics. A photo is just a split second out of the entire day, they may have been focusing on the show. No couple - no matter how in love, spend 24/7 staring into each others eyes. They were there as Olympic ambassadors and to support Team GB. So, my honest opinion is they are a very happy couple. I just feel *very* sorry for them having their relationship dissected with each photo that comes out. I so agree with you Charlotte, there is nothing wrong with the relationship of the beautiful Duchess & her Prince. If you look at all the photos that are taken of them in the past few months you will see how much in love they are. I don't know what pictures people are looking at (sorry Ana Laura)but there is nothing in these photos that would say there is trouble in their marriage. All you have to do is look at the photos from last night and the other day and just see how they look at each other. If there was trouble you would not see them having that look of love between them. This is just my opinion and how I have looked at the photos. Thanks Charlotte, your opinion is really very important to us. Kisses! Cheers and hats off to London for a superb opening ceremony!!! I loved the Queen's fly-in, yet possibly my favorite parts were also the flying bicycle, the winged creatures whizzing around the stadium in the darkness, the smiling torchbearer on David Beckham's speedboat, and most of all the copper leaves brought in by each nation, lit by the next generation of British atheletes, and forming the cauldron! Who could top this lighting of the cauldron at any future Olympics? Perhaps it sets a new trend on the tradition. I loved the Opening Cememony. Britain put on a great show. Just loved seeing William & his beautiful Duchess together having a great time. But they did look a little tired but they also had one long busy day. They both looked like they were enjoying eah other and what was going on around them. Wonder what they thought when their wedding picture was shown, I bet William & his Duchess were red faced...lol I thought it was great of them to show it. I have read that William has been spotted at a venue, have you heard nor read anything? The Opening ceremony was absolutely wonderful, magic and amazing! It just took my breath away! How beautiful are Kate's diamond earrings and how appropriate! By the way, I would like to share this link with you all. I found these photos really great. Best regards from the South of France!